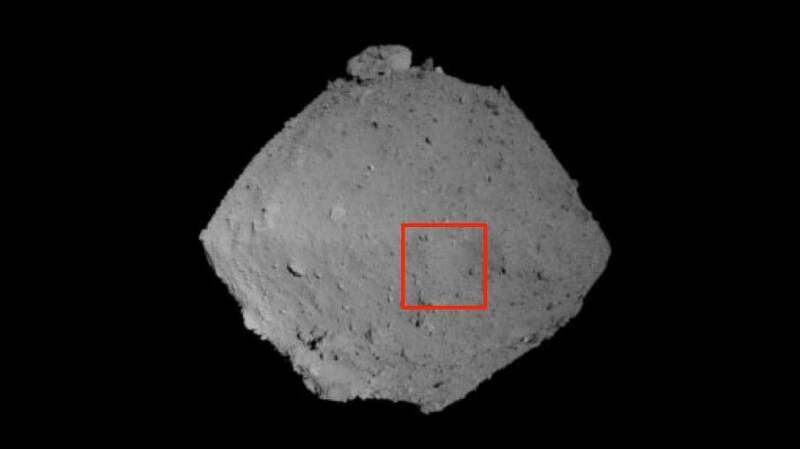 Earlier today, Japan’s Hayabusa2 spacecraft came tantalisingly close to Ryugu, offering an unprecedented view of the asteroid’s boulder-strewn surface. 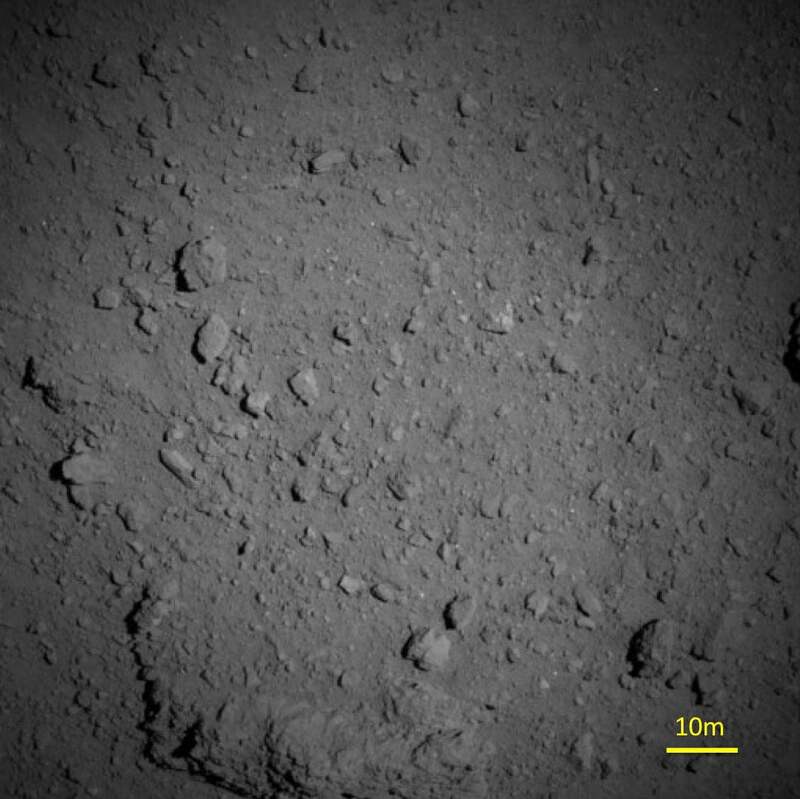 Two weeks ago, Hayabusa2 came to within six kilometres (3.7 miles) of Ryugu, but today’s descent, the third of the mission, saw Hayabusa2 come to within 851 meters (2,800 feet) of the asteroid, making it the closest encounter to date. Mission planners are preparing for a procedure that will see Hayabusa2 collect samples of rock and dust from Ryugu’s surface. Today’s descent was done to measure the weak gravitational pull exerted by the kilometre-wide asteroid. The latest descent began yesterday around 11:00 a.m. Japan time, when Hayabusa2 was about 20 km (12.4 miles) away from Ryugu. At around 8:30 p.m. the same day, the probe began to free fall towards the asteroid upon reaching an altitude of six kilometres (3.7 miles). Hayabusa2 got to within 851 metres of the asteroid around 8:10 a.m. today, at which point it engaged its thrusters to move away from the rock again. 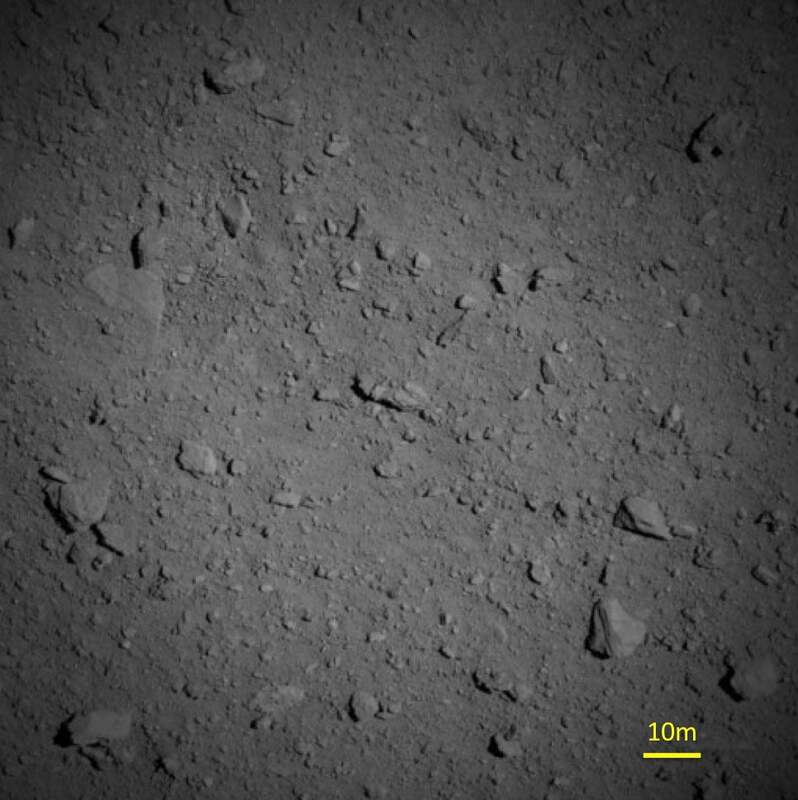 During the descent, Hayabusa2 snapped photos with its telephoto optical navigation camera (ONC-T) and its wide-angle optical navigation camera (ONC-W). The 10-metre (32.8 feet) scale bar at the bottom of the photos provide the needed perspective. What looks like a few rocks strewn across the surface are actually large boulders.